OLPC – Please, some cultural respect! In an earlier post I was claiming that the designers of the MIT’s 100$ laptop do not understand the context in and for what they are designing their tool. They seem to ignore all cultural and social factors and considerations. Now the One Laptop per Child (OLPC) website is available in fourteen languages. Among those there is a Finnish (Suomeksi) version. Great! – Doesn’t this show that they take the cultural issues seriously? …uuhh not really. Does this tell something about the people in the OLPC project? Do they show respect on my culture and language? Does this show that they will consider people’s – they are those things often called “users”- social and cultural matters when designing the laptop? I am not sure, but at least they could hire professional translators to do the translations. Next Tuesday, May 9 at AM 9.15-10 in the University of Tampere (Finland), lecture hall C 8 (main building) Walter Bender, Executive director of the MIT Media Laboratory and the president and COO of the One Laptop per Child foundation will give a talk with the title “imagine if all children were given a hundred-dollar laptop…”. Use your right to attend to university lectures and be there! I’ll be there, if I am not dead tired from my trip to Bogotá. This post is a rant. You are unhappy about something (your own project's future with mobile devices in education?) and you take it out on the OLPC. You give the impression that you are a newcomer to FLOSS…If you are unhappy with the Finnish translation, you can make the effort to contribute a better version. In FLOSS, it's common to contribute to such small tasks for free. Hi Simon. Of course the post is a rant. And yes you are right I am unhappy about something. The something is (1) the misuse of my language and (2) how the 100$ laptop design and development is carried out. I am not sure if there is a connection between these two points – but it is possible.I hope all the best for the 100$ laptop project. We need cheaper and more durable computers – no doubt. Rising up the issue is the best thing that the OLPC has done. There are just some major issues on which I do not agree with the OLPC. First at all, my opinion is that the design and development of the 100$ laptop should be done in those countries with those people who are expected to be using the latops. I am asking for “participatory design” – not only because this is the way to design better products, but also because it is the right thing to do. Secondly, I do not see enough pedagogical consideration and arguments favouring introduction of laptop for every child in developing country’s schools. I do not believe that from the learning perspective laptops are what the schools really want or need. There are simply many better ways to spend the money: teacher training, electricity, sanitation, food, paper learning materials, pens, school desks… Investments made to the laptops will be out of these.Thirdly, the 100$ laptop project is not a free/libre project. To become a free/libre project there should be a plan to publish all specifications of the hardware (components, materials etc.) and guidelines for manufacturing. This would make it, at least in theory, possible for the manufacturers to start production in those countries that are expected to buy and use the laptops. This is not part of their current deployment plans.With almost 10 years of FLOSS development I do not consider myself newcomer in the field. 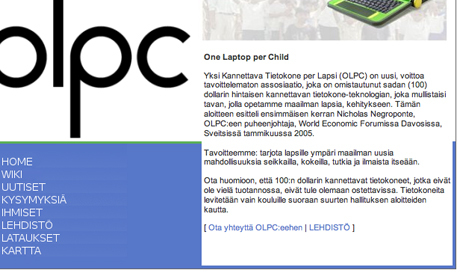 I am happy to contribute a Finnish translation to the OLPC site immediately when the project is free/libre. To be free/libre project is my basic requirement for contributing. I do not speak for the OLPC project (I am not affilicated with the OLPC project anyway).Point 1 (Participatory Design): I do not know for sure whether the OLPC project took steps that cover some of the description of PD. Reading the various material, I feel that they have taken in cosideration (at least in an ad-hoc manner) input from the end-users. The software that will be installed for national projects is in the discretion of the national projects themselves. So, if you want a Finnish OLPC, you need to pick and choose the software that your users will be mostly benefited from.There will be new generations of the OLPC getting available that can address such concerns. Asking for "what do you want from a laptop" without the person having any prior experience is not very helpful.Point 2 (Other priorities first): This is a standard issue that you see in every aspect of life. Should we pay for space exploration or solve poverty on Earth? Should young couples have children early or wait until they wealthy enough? The OLPC can be used in "reading" mode (grayscale LCD, over 200dpi) that makes it very good for reading books. Compare a huge stack of books with their ebook counterparts. The OLPC really scales for book-reading…Point 3 (open hardware design): The hardware is already open. If you are interested, you can buy the individual components and assemble yourself. It's cheaper though to assemble at a central location like Taiwan or China. That's way almost all laptops in the world come from that region. The OLPC will be the first computer with an open BIOS (LinuxBios.org) which is really amazing.I have noticed (http://www.laptop.org ) that Finland did not show interest for the OLPC. Those involved already got or are getting now the electronic components of the OLPC and are testing it. It does not come as a assembled laptop; it's bits and pieces (the tiny motherboard has most of the components) that you have to lay on a table and connect with extension cables. However, it works and it's really cool. To have an idea how this looks, try any of the minimal Linux distributions such as Puppy Linux (http://www.puppylinux.org/ ). I really hope all the best for the OLPC team designing a simple, robust and durable laptop. This is great – we all need them. The problematic part is the promotion of the laptop as a great tool for learning in developing countries. "If the only tool you have is a hammer, then everything starts to look like a nail.”Discussion:Point 1 (participatory design): PD is a bit more than “considering input from the end-users”. PD is about context, situation and democracy in design process. I have not seen any document or news showing how the OLPC design would take place in the environment – let say rural Africa – where the laptop is planned to be used. I have not seen any document or news presenting teachers and students, from those places where the laptops are expected to be used, participating in the design process.Point 2 (pedagogical priorities first): This is not exactly a standard issue. The investment made to the one million laptops (1 000 000 X 100$ = 100 000 000$) will be straight out of the educational budgets of the countries purchasing the laptops. The other things important to achieve learning results – such as teacher training, school building, sanitation, books, paper and pen etc. – get the money from the same budget. So, if the money goes to laptops it does not go to something else. Simple. One should look the investment from the pedagogical point of view.Point 3 (Free/libre hardware design): I have not found any document or news promoting the local small-scale assembling of the OLPC laptop in those countries where they are planned to be used. Look for industrial automation for existing products.The OLPC is still being designed. I wouldn't be surprised if there was no hardware documentation yet, as it has not been delivered yet. As with all laptops, a person with experience on desktop systems should be able to figure out how it works. Previous Post Linux installation standardisation: yes please, do something about it! Next Post IP in an Open Source Society; who is paying who?